Something I’ve long struggled with in this industry is the issue of perspective. In particular, I find that perspective is often lacking in media coverage of climate and cleantech — the topics we primarily cover. Consider it like this: If we knew everything there is to know, we’d have perfect perspective on every issue. We’d know the difference in importance between a grain of sand and a gigantic freshwater lake. We’d know the difference in importance between Lionel Messi and Zachary Shahan in the world of soccer. We’d also know how much certain news headlines inflate the importance of a topic, and thus, how much they warp the value that the public puts on that topic. Naturally, we don’t have perfect knowledge of all things. But the problem is when those in charge of collecting and conveying information do such a poor job that they create broad misconceptions across our society. One thing I love about this career is learning from readers. Sometimes — perhaps even frequently — I find that readers better explain the value and point of our work than I’ve explained it to myself. I’ll be rude for a moment and call out a couple of readers who recently did this to a powerful extent for me — Matt Pressman and @neroden. They and many others stimulated this article, but more than any of that, the warped picture the mainstream media is painting is the core stimulus. That is the reason we keep writing about certain Tesla topics, and other cleantech topics — because we see misrepresentation or lack of perspective in the broader media, in internet discussions, and sometimes even in the “real world.” We want to correct those misconceptions, but when there is a much higher volume of stories published in major media outlets reinforcing the misconceptions, we find we are swimming against an insanely strong current of B.S. The thing is, it’s often not about false facts. The problem is often that perspective is dramatically out of whack in major media outlets when it comes to Tesla, EVs, and cleantech in general. The other thing is that messaging is extremely influential but seldom considered by journalists, who have a tendency to fool themselves into thinking they are being objective. Messaging is about much more than getting facts right. Messaging is a very special professional activity. Often, it is about identifying a couple of key concepts and drilling them into people’s heads as often, potently, and simply as possible. Sprite’s messaging is about refreshment. Nike’s messaging is about motivation. Obama’s messaging was (and still is) centered around hope. Messaging doesn’t mean explaining — in fact, it’s largely the opposite. It’s about giving you a very simple concept and repeating it enough times that you assume it’s true even if you haven’t dug into the fundamentals and adequately evaluated the claim. The problem I have is that much of the media seems to be in the business of messaging even though they don’t acknowledge it or even understand it. More importantly, they are often in the business of messaging things that are misleading and counterproductive to society. Let’s just roll through a handful of topics to get more specific and practical about how Tesla is so unfairly and counterproductively smeared in the media. I think it’s worthwhile and important for the media to put companies and people into broader perspective. If not in every piece, in at least some articles, outlets should clearly explain a company’s or notable person’s contributions to society. They should explain if a company is playing a critical role in saving humanity from global warming and pollution, or if they are engaged in the opposite kinds of actions. With regard to Tesla, they should explain that the company is still a teenage startup from Silicon Valley yet has 40,000 employees who are actually not paid to burn as much cash as possible every day. They’re employed to make things. Mostly, they’re employed to make cars — a lot of them. 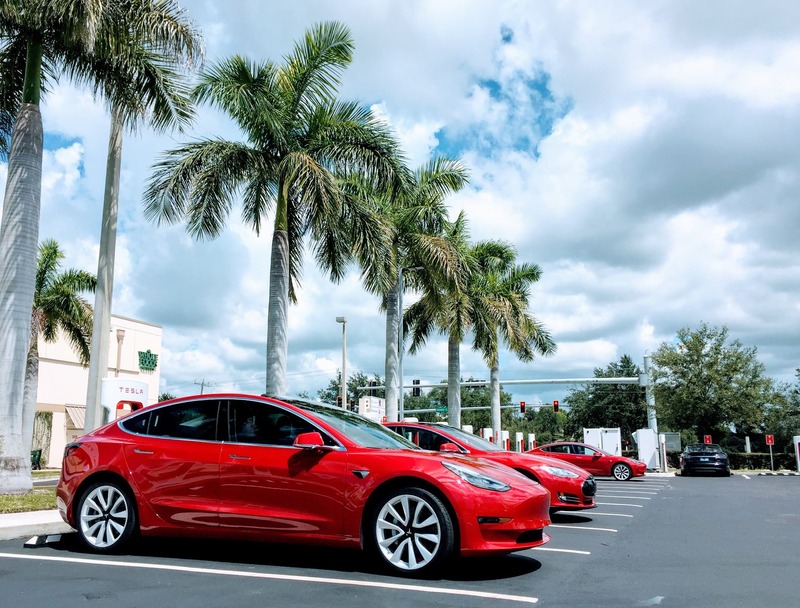 The media should explain, when relevant, that Tesla has quickly become an economic powerhouse and has pushed large automakers to hasten their own transitions to zero-emissions electric vehicles, another societal good. Perhaps high-quality media outlets could try to quantify how much Tesla has improved human health, how much it has boosted the economy, how much it has created jobs for working class Americans, and how much it has brought down battery and electric vehicle costs. If they are writing about certain societal challenges Tesla has created, the article should balance those out with societal benefits. If they are writing about an employee incident or two, they should try to provide some context and scale to the issue, perhaps highlighting the tens of thousands of people Tesla employs and the frequency of similar issues at other manufacturing companies with tens of thousands of employees. It may also be useful when writing about Tesla to emphasize more frequently that the company’s mission is to hasten the transition to sustainable energy — to address critical environmental and resource challenges. That is a matter that seems to often be lost on people. Tweetable tl;dr: Elon Musk and Tesla are doing a tremendous service for society. That is their underlying mission. Yet the mass media seldom acknowledges this or how important it is to the future of human society. Something that is perhaps hard for media outlets to discuss is Tesla’s potential future position in the car market. There are too many variables to consider and no reporter, investor, or auto exec really knows what is coming. 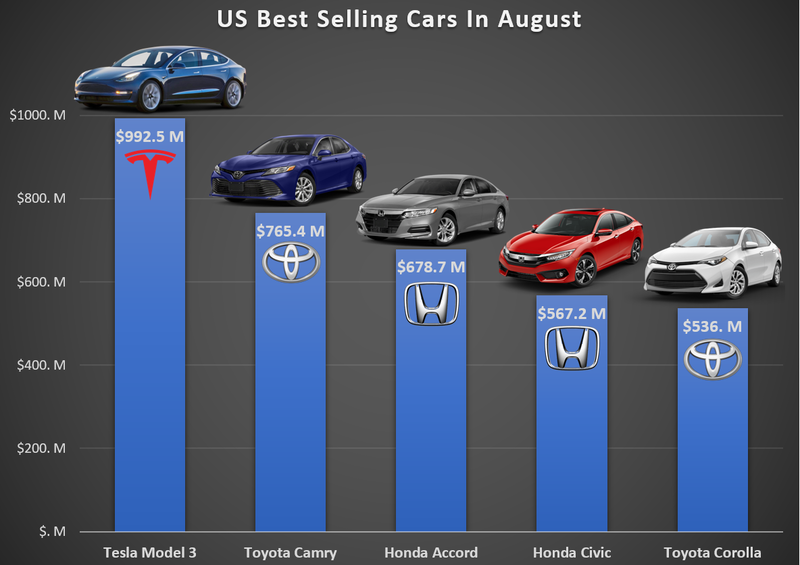 However, the thing that shocks me is how bad the media is at explaining Tesla’s dominance of the US electric vehicle market today, its dominance of the US luxury car market today, and also now its leadership position among cars of all classes. 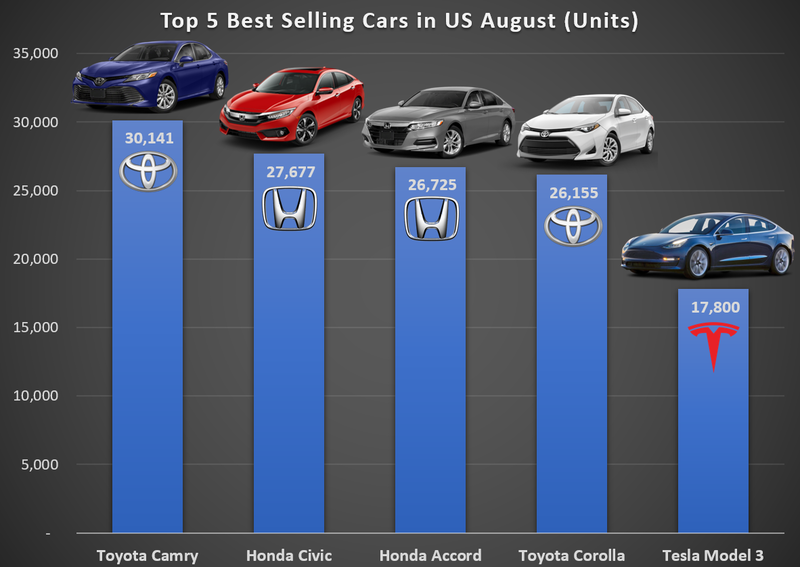 It shocks me that a young startup out of Silicon Valley now has the 5th best selling car in the country in terms of units and 1st in terms of revenue. It also shocks me that the mass media never seems to note this. Of course, the media also isn’t noting that it is different from the other cars on the top 10 list in that they are significantly cheaper, making the Model 3 a weird kind of super performer like we’ve never seen before. It’s simply crazy to have a $60,000 car (average selling price) selling in such high volumes. This is a dramatic American automaker success story, but the media isn’t telling the story. As I often do in articles in order to try to get this message out there, I’m including a long sequence of Tesla sales charts before going onto the next topic. If you’ve already seen them, scroll fast and don’t complain! Tweetable tl;dr: Tesla dominates the US EV market and the US luxury car market. It actually has the 5th best selling car by units & 1st by revenue. The mass media doesn’t acknowledge this stunning achievement from an American company that started mass producing cars just 6 years ago. Tesla’s sales position in the market is specifically tied to its product competitiveness. For those who can read and comprehend basic logic, this is old, old news, but it is somehow still a point of debate in many discussions. Furthermore, as I’ve highlighted a few times recently, there’s a ton of media coverage of so called “Tesla killers” even thought Tesla is actually the one rapidly taking market share from the others. The core problems with that Tesla killer concept are that the competitors’ products are not as good as Tesla’s, are planned for future years when Tesla’s offerings will be even better, and don’t have grand supplies of batteries even if they have strong consumer demand. 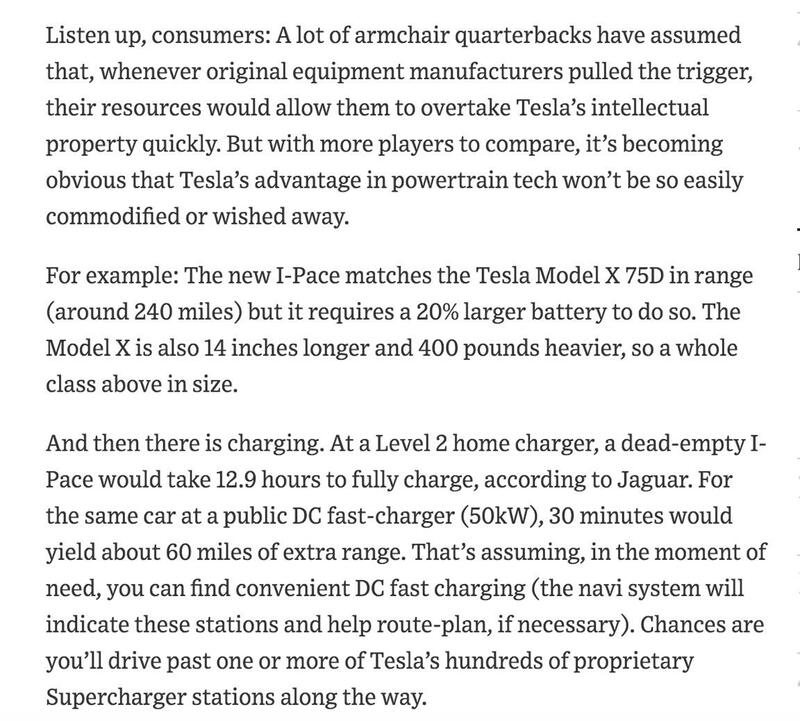 Aside from those comments, I’ve heard the drive quality isn’t the same and the overall package doesn’t compare to the 21st century gold standard Tesla has set. And perhaps the most notable thing about that comparison is this line: “Jaguar’s jump into the electric SUV space has beaten the likes of Porsche, Mercedes and BMW to market by about 18 months. But it’s still in Tesla’s shadow.” The point is that the I-Pace is the closest vehicle to a Tesla, but it’s still not very close to a Tesla. Why is the term “Failure at Tesla” rolled into that graph? Because of Tesla’s difficulty quickly ramping up production to the level of consumer demand. Why is that fundamentally a problem? Because there’s so much demand for Tesla’s vehicles. The challenge gets bigger for each model. Imagine what it will be for the Model Y crossover! But the bottom-line point is that even “failures” at Tesla would be successes at other automakers. 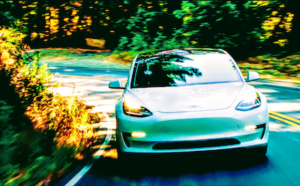 Tweetable tl;dr: Tesla’s vehicles are better. The mass media seldom acknowledges this and often misleads by implying the opposite. The graph above helps to put Tesla’s manufacturing problems into some perspective. Even working through manufacturing problems, Tesla’s production ramp for the Model X was significantly steeper in 3 years than the production ramp of the Toyota Prius, Nissan LEAF, BMW i3, and Chevy Volt. The Tesla Model 3 production ramp has been insanely steeper. But that graph just tells part of the story itself. As I recently highlighted, Tesla introduced its first car (a limited-production Roadster) 10 years ago. 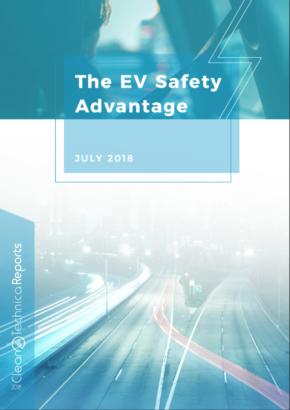 Today, it is achieving a production rate of ~300,000–400,000 cars a year. Perhaps more dramatically, Tesla introduced its first mass production car, the Model S, in the middle of 2012, which means it took only ~6 years to get from 0 mass produced cars to a production rate of ~300,000–400,000 per year. WTF? Do major media outlets report this? 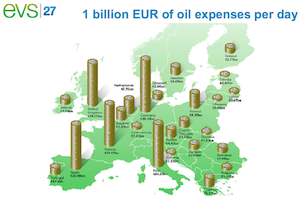 Do they show such charts? Do they have any interest in publishing a positive, inspirational story about American superstar Tesla? No, they’re more interested in Elon Musk puffing a joint (and not inhaling) on Joe Rogan’s podcast. They’re more interested in whether Elon Musk should be ousted — for some odd (or not so odd) reason. In other words, in the midst of so much hype about the US losing manufacturing jobs, there’s apparently no appetite to highlight that a teenage American carmaker is already producing hundreds of thousands of cars a year and employing tens of thousands of people. Tweetable tl;dr: Tesla has scaled up production (and demand) at an incredible pace. Has any company in history matched what it has done? One thing we’ve found in our #Pravduh About #Tesla project is that many stories involve investigations. However, as far as we’ve seen, the investigations are not as threatening or atypical as they’re often portrayed. Investor and investment advisor Ross Gerber recently highlighted that there are ongoing DOJ investigations of several major corporations — investigations you surely aren’t aware of since they don’t get covered as much as Elon sneezing. Are Tesla investigations overhyped and over-covered? Definitely! 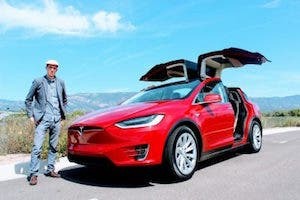 Is the whole goal to smear Tesla [TSLA]? That’s the question. It’s hard to say. Tesla’s finances are often hyped as shakier than a blob of jello in an earthquake. Aside from Elon, Tesla CFO Deepak Ahuja has assured the world on multiple occasions that things look very good in Tesla’s financial sheets and forecasts. We’ve dug into the matter in depth ourselves to try to understand who’s wrong — the critics or Tesla. From what we’ve found, it’s the Tesla critics. We have found that Tesla is sitting on a healthy financial hand and has a bright future. I won’t go into this in depth because of how much we’re already done so, but I encourage you to go through our Tesla bankwuptcy and Tesla financials files. Why is there so much negativity about Tesla’s finances if they are so good? That’s the multi-billion-dollar question. Why is so much money being put up against Tesla? Do these people really buy their own FUD, or is there a concerted smear campaign or five aimed at bringing Tesla down? I don’t have an answer to that, but it may be the most common question popping into my head. 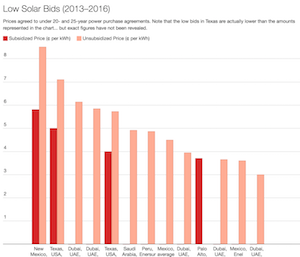 Tweetable tl;dr: Tesla’s finances look great. Claims otherwise are baffling. Are the critics confused, simply pessimistic, or purposefully trying to hurt Tesla with financial smear campaigns? Note: CleanTechnica doesn’t provide investment advice. 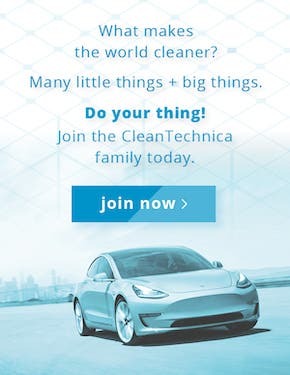 If you are considering investing in anything, in fact, we encourage you to drop that idea and just drop CleanTechnica some cash to do the work we do for you. When all else fails, the media can tweet about your mother. Let’s hope it doesn’t go there. Tweetable tl;dr: Hit-piece Tesla reporters, please don’t go lower than the disappointingly super low level you’ve already gone.